My thanks go to Laura, who got tickets for this Harper Collins event in Toronto! 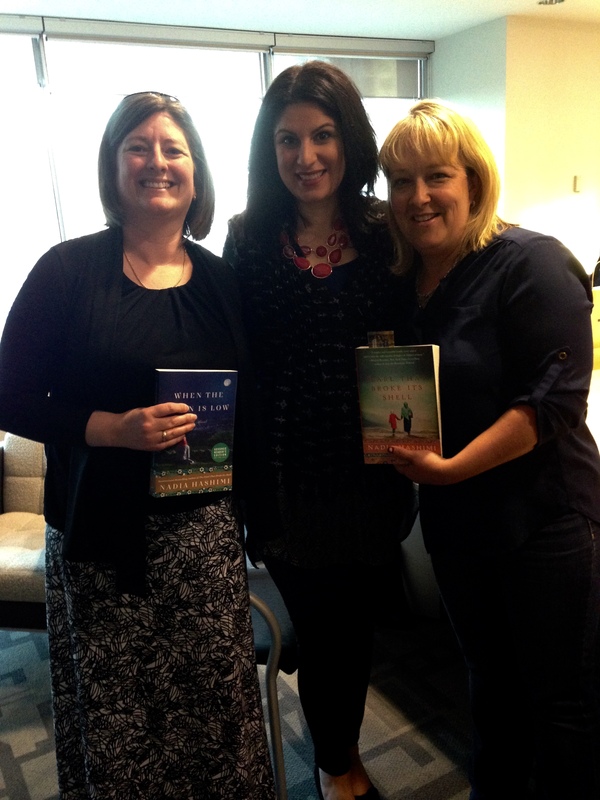 We were pleased to meet author Nadia Hashimi in an intimate event in the publisher’s board room. The author spoke about her newest novel, When the Moon is Low (which is being released this summer) and her first novel, The Pearl Who Broke It’s Shell followed by a question and answer period. This amazing author balances her time between family, writing and her career as an Emergency Room Paediatrician in Washington, DC. She spoke of completing her novels on her days off and setting deadlines for her books in alignment with the due dates of her children (she is the mother of 3 and is expecting her fourth child). She shared that she spends a great deal of time writing at Panera, “chasing characters” and how important it is to “do what you love.” She expressed her love of reading and that although she appreciates a physical book, being able to download books to her phone gives the freedom of carrying her reading with her so that she can read anytime that she has a chance. Her parents moved from Afghanistan to the United States in the early 1970s. She spent a childhood filled with family. Her parents owned a convenience store/Italian deli so she was immersed in her community. Her family was very happy that they had come to the United States, so much so that her inlays celebrate the anniversary of their immigration. It was easy for the audience to consider how different her life could have been had she remained in Afghanistan where opportunities for women have been limited. Nadia tells tales of strong women and her goal is that she conveys what has happened (and continues to happen) to women through fiction. She weaves her stories with research gathered through interviews, the library and gathered during her trip to Afghanistan in 2002. Her experiences growing up have “fed into the book” as well as an influence from everything that she has read. The room chuckled when she admitted that her secret is that she can write a book but that she cannot title one – her agent has picked the titles! She is thankful for the encouragement of her husband and shared that she is currently writing a book for middle-schol children with a theme of what it means to be a girl and focus on depicting powerful women. She is also working on another novel focusing on the injustice within women’s prisons in Afghanistan where women can be jailed for both real crimes and “moral” crimes. Nadia clearly loves sharing her stories. Her best compliment is that it was the “longest discussion our book club has ever had” and she strives to help readers feel and think differently about what is happening to women. Her goals include having readers open their eyes, have conversations about what is happening to women and learn through her stories. I am looking forward to reading my signed copy of The Pearl Who Broke it’s Shell this weekend followed by my advanced copy of When the Moon is Low which will not be released until later this summer. It was a fantastic evening at Harper Collins and I feel that I have met an amazing woman who is an example to others by doing her part to make a difference in the lives of women and children while sharing her love of reading and writing. Participating in the conversation that evening made me want to sit down and have lunch with Nadia and learn more about her experience, her life and her research! This entry was posted in Historical Fiction and tagged Harper Collins, Nadia Hashimi, The Pearl Who Broke It's Shell, When the Moon is Low. Bookmark the permalink.